6 gpm / 22.7 lpm. 25 nominal microns. Filters hot or cold water. 10 gpm / 37.9 lpm. 5 nominal microns. Effectively reduces unwanted taste, odor and chlorine. High efficiency sediment 5 Micron filtration. Fits the popular AP801 and the new AP802 jumbo housings, also compatible with competitive jumbo filter housings. 5 Micron nominal filtration efficiency for 'normal' dirt loading. Premium performance graded density filter for longer life and high dirt/rust removal efficiency. Fits the popular AP801 and the new AP802 jumbo housings. Compatible with competitive jumbo filter housings. 20 gpm / 75.7 lpm. 5 nominal microns. Fits the popular AP802 jumbo housings. 45 gpm / 170.3 lpm. Cartridge Dimensions: 19 7/8'' High x 4 5/8'' Diameter. Fine/Normal Sediment Removal (5 Micron Nominal). Graded Density For Long Life. 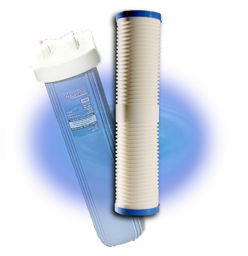 Filters Hot & Cold Water (up to 100? F). Flow Rates up to 45 GPM. Single Action for Dirt & Rust Removal. Built-in 'shut-off valve' with pressure relief for fast and easy cartridge changes. No additional valves required. Lower installation costs. Pressure tested high-impact plastic design which provides protection against pressure surges and water hammer. Premium performance AP110 Graded-Density depth cartridge which makes for a complete system with high efficiency, long-life cartridge. 'Aqua-Grip' filter wrench included to provide for fast, effortless sump removal for changing cartridges. System tested and certified by NSF International. Verification of system design and performance by recognized third party certifier. 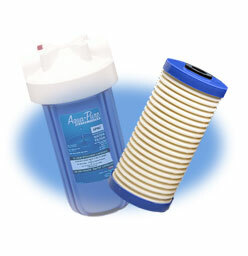 Manufactured from FDA CFR-21 compliant materials to conform to public health requirements for water purification. Suitable for drinking and cooking water and all food applications. AP110H/C cartridge included. Wrench included. 3/4 in. pipe connections. 6 gpm / 22.7 lpm. Valve-in-head. Complete installation manual enclosed for easy reference and simple installation. Select your choice of the clear ''see-Through'' (101T) or ''opaque Solid'' (101S) filter housing. See through housing for convenient viewing of cartridge condition or U.V. resistant; Opaque housing for outdoor use.